Boston Marathon Islamist killers. These were Muslim “refugees” welcomed into the U.S.
A Kazakhstani immigrant with lawful permanent resident status allegedly conspired to purchase a machine gun to shoot FBI and other law enforcement agents if they prevented him from traveling to Syria to join ISIS. An immigrant from Saudi Arabia, who applied for and received U.S. citizenship, swore allegiance to ISIS and pledged to explode a propane tank bomb on U.S. soil, prosecutors said. A Uzbek man in Brooklyn encouraged other Uzbeki nationals to wage jihad on behalf of ISIS, and raised $1,600 for the terror organization. 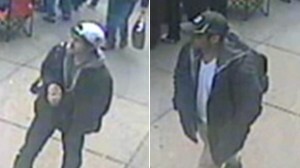 The Boston Bombers, who killed three and injured more than 250, were invited in as refugees. The younger brother applied for citizenship and was naturalized on September 11th, 2012. The older brother had a pending application for citizenship. An Uzbek refugee living in Idaho was arrested and charged with providing support to a terrorist organization, in the form of teaching terror recruits how to build bombs. He was later convicted three terrorism-related charges. Should Christian refugee children be allowed to celebrate Christmas? An American citizen whose family is from Syria was sentenced to up to five years in a juvenile prison for plotting to support ISIS and rob a gun store to kill members of the American military. A college student and Somali immigrant, who later applied for and received U.S. citizenship, attempted to blow up a Christmas tree lighting ceremony in Oregon. He is serving a 30 year prison sentence. An Iraqi immigrant, who later applied for and received U.S. citizenship, was arrested for lying to federal agents about pledging allegiance to ISIS and his travels to Syria. Texas Gov. Greg Abbott referenced the case when announcing his state would fight against accepting Syrian refugees. Two immigrants from Pakistan, who later applied for and received U.S citizenship, were sentenced to decades-long prison sentences for plotting to detonate a bomb in New York City. An immigrant from Yemen, who later applied for and received U.S. citizenship, was arrested for trying to join ISIS. He was also charged with attempting to illegally buy firearms to try to shoot American military personnel. He is currently awaiting trial. He faces additional charges related to assaulting deputies while in custody. An immigrant brought here by his family from Kuwait at a young age, and who was later approved for U.S. citizenship, carried out the Islamist attack that recently killed 5 military personnel in Chattanooga. The gunman was killed by police. Read more: 26 terror plots in US tied to immigrants, Sen. Jeff Sessions says: ‘Screening is very poor’ | AL.com; Nearly 70 are arrested in America over ISIS plots and they include refugees | Daily Mail Online.